It is that time of year again, when a lot of rural Newfoundlanders and Labradorians gear up with jugs, buckets and other containers to the barren fields in search of the red ruby berries, known to us as the “partridge-berry” and internationally as the “Lingonberry”. The following information has been taken directly from the Dark Tickle Company’s, St. Lunaire-Griquet, NL website. Partridge berry (Vaccinium vitis-idaea). Internationally known as the lingonberry this relative of the cranberry family is a low mat forming evergreen shrub with tiny rounded leaves. 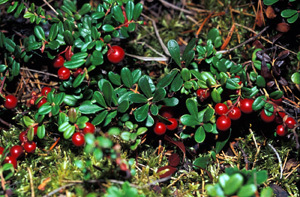 These berries grow in the dry, acidic soils of Newfoundland and Labrador’s barrens and coastal headlands. Their twin flowers have a pinkish hue in bud then turn white as they bloom in mid-June to mid-July. The fusing of the two flower ovaries gives rise to a single dark red berry ripening through September’s frost. Tart in flavour they are high in vitamin C, tannin, anthocyanin, and antioxidants. These agents are attributed to the prevention of high blood pressure, urinary tract infections, cardiovascular disease, cataracts, slowing such aging processes as memory loss and the deterioration of motor skill, improving circulation, as well as the prevention of certain forms of cancer. Well, we have experienced the first September’s frost this past Saturday on the Northern Peninsula making it the opportune time to get your berries. I remember picking with my family near the barrens near the St. Anthony airport. There would be patches of red, where you could pick to your heart’s delight. I’m not the biggest fan of this berry, it is a little tart for my taste. I prefer the bakeapple (cloudberry), however this was a fun activity for the whole family to participate and enjoy. Partridge berry’s are loved by many people. The berries find themselves in many jams, jellies, fillings of pies, side dishes or garnishes. However, there is an opportunity to diversify these agri-food products and add greater value. The Dark Tickle Company has done an exceptional job of creating chocolates and teas using these berry products. Rodriguez Winery in the province produces many speciality wines and liqueurs from fruit and berry products. Check them out at: http://www.rodrigueswinery.com. While visiting the Norsemen Restaurant & Gaia Art Gallery, L’Anse Aux Meadows (http://www.valhalla-lodge.com/restaurant.htm) I had the opportunity to sample a drink called the “Partridgrini”. I don’t know the recipe, but did find one from “Occasions Magazine”, which is distributed by the Newfoundland & Labrador Liquor Corporation. Opportunities exist to diversify as consumer tastes broadened in rural communities to appeal to both locals and tourists. We are not limited to local markets, as exporting is readily available. Don’t get me wrong, there will always be a special place in our hearts for Grandma’s Partridge berry pie or Mom’s jam. However, we can be creative and find additional uses for this renewable natural resource that grows in abundance on the Northern Peninsula of Newfoundland & Labrador. Enjoy your experience with the Partidge-tini!